WOLFEBORO — Animal rescuers and police officers, even the most veteran among them, were taken aback on Friday, when they entered a 14,000 square-foot mansion, at 149 Warren Sands Road, to find a scene of filth and neglect. 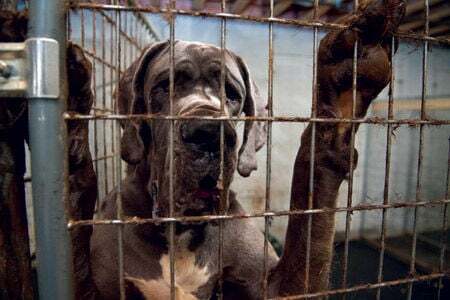 By the end of the day, 84 Great Dane dogs – 75 from the home in Wolfeboro, a litter of nine more from a property in Bartlett – had been seized, and the owner, Christina "Tina" Fay, had been charged with two misdemeanor charges of animal cruelty. Calling her an operator of a puppy mill, police say more charges are likely to come. Fay is alleged to be the operator of De La Sang Monde Great Danes, which claims on its website to be operated out of Maine. A phone number listed on the website wasn't answered, and the email listed on the site was no longer functional as of Saturday afternoon. The website's "Puppies" page offered one for sale, a 16-week-old female with full AKC registration for $2,200. Wolfeboro police, as well as humane society representatives, described the operation at press conference held Saturday morning at the Wolfeboro Town Hall. Fay had moved to Wolfeboro a few years ago. The home was assessed at $1.5 million and situated on a 53-acre lot. Neighbors had made prior complaints about the noise of barking dogs, but Fay had told town officials that she had 15 dogs that she kept as pets. But when people who had been inside the home began bringing their concerns to other agencies, such as the Pope Memorial SPCA in Concord, Police Chief Dean Rondeau said it became clear that there was more going on than someone with just a few more pets than usual. "It was a home that was used as a commercial business. These were not pets. This was a commercial operation that had gone wrong," said Rondeau. "The conditions inside the home were simply appalling." "I'm a combat veteran," Rondeau said, referring to a prior career in the Army. He made a point to enter the home prior to any of his officers. "I'm not ashamed to tell you that I was upset. I was absolutely sickened by what I saw... I can't describe it adequately, other than to use the words abhorrent and appalling ... I have never seen anything like this in my career in law enforcement or in my career in the military." Tona McCarthy, director of cruelty investigations for the Pope Memorial Humane Society, said he also found the experience unsettling. "I've got to tell you, in my years of experience, I've never seen a case like this place," he said, especially due to the size of the animals and the condition of the home. "It some point, I got choked up... It's terrible to see someone treat animals like this." The sprawling home was filled with Great Danes, some in crates and kennels, others occupying rooms in the home. The floors were covered with feces and raw meat – the dogs were apparently being fed raw chicken, which wasn't being stored properly – and some of the animals had injuries or had infected and swollen eyes. The ammonia in the home was so strong that rescuers had leave the building on occasion when their eyes and throat began to burn. Rondeau said that there were two other adults living in the home, in addition to Fay. Neither of those two have been identified or charged at this point. Lindsay Hamrick, the New Hampshire state director for the Humane Society of the United States, said that none of the animals required emergency attention, but that a team of veterinarians, including Dr. Monique Kramer of Fryeburg, Maine, and Dr. Sarah Proctor of the Cocheco Valley Humane Society in Dover, were examining the dogs over the weekend to ascertain their need for medical care. She added that it's possible that some of the dogs are pregnant. The investigation into possible animal cruelty began on May 8, said Rondeau, and although his officers determined fairly quickly that there was enough evidence to bring charges, the raid had to wait until the department could build, with considerable help from the Humane Society, a plan to rescue and care for such a large number of such a large breed of dogs. The Great Danes at De La Sang are of a European bloodline, and some were as big as 300 pounds and five feet tall. "This was a huge undertaking – we can't just seize these dogs and have no plan to put them (somewhere)... The logistics piece was quite substantial, quite enormous," said Rondeau. In addition to the Humane Society of the United States, Wolfeboro Police was aided by the town's Fire and Public Works Departments, Pope Memorial SPCA, Carroll County Sheriff Department, Bartlett and Barnstead police, State Police, the Conway Humane Society and Stewart's Ambulance. It took about 14 hours on Friday to effect the operation. The Humane Society had brought two semi-trailers to transport all of the animals, but only the juveniles were small enough to fit in the trailers' crates. The fully-grown animals were removed from the property using horse trailers. The dogs were all brought to a temporary shelter at an undisclosed location that the Humane Society of the United States set up specifically to care for these dogs. Because the animals are considered evidence, they will be held until the case against Fay is resolved. Depending on the outcome of the case, the dogs could then be made available for adoption. In the mean time, Hamrick said the dogs will be socialized with humans, offered a safe and clean place to live, and will be provided enrichment every day, including introducing them to collars and leashes for walks. Caring for the dogs could cost "hundreds of thousands of dollars," she said. State law makes that care the responsibility of the town, she added, although the Humane Society has pledged to cover those costs. Those who wish to contribute toward the effort may make a contribution to: www.humanesociety.org/rescue. Hamrick was critical of the state's laws regarding the regulation of breeders. Currently, a breeder doesn't have to register with the state unless he or she sells 50 or more puppies, or ten or more litters, per year. "There's a difference between hoarding, which is a mental health issue, and a puppy mill situation. Puppy mills are run to make profit off of the animals," said Hamrick. She encouraged anyone interested in owning a pet to consider adopting from a shelter or rescue organization. If someone wants to purchase an animal from a breeder, she said they should insist on being able to visit both of the animal's parents, and to see the conditions it was living in. "There's a perception that puppy mills happen in the midwest and the south," said Hamrick. "We estimate there are 10,000 puppy mills in the country, clearly there are some in New Hampshire. We are not immune to that." The Humane Society of the United States operates tip line for information regarding puppy mills: 1-877-MILLTIP. If information leads to a conviction, Humane Society will offer a $5,000 reward. – Thomas P. Caldwell also contributed to this story.